Up to this point in the open water fishing season, lots of anglers have been fishing. May and June are outstanding months for fishing, and those months are when a lot of anglers go fishing. Maybe it’s because they’ve been inside much of the winter and just want to get out, but also, May and June are just nice months to be on the water. The next couple of months can be kind of hot, but the fish still bite in July and August. In fact, with the warmer water temperatures they eat even more. There are a lot of things that can occupy our time in the summer, but if you can get away for a couple of hours to go fishing, you should do so. Across much of North America, there are a lot of places to go fishing. Many of those places get overlooked, but now is a good time to look into them. I’m sure that there are overlooked fishing opportunities close to where you live. Small rivers can be particularly good this time of year, and they can be really fun to fish. Smallmouth bass and northern pike are the primary targets in many of these rivers, but walleyes can also be taken. These rivers don’t require much equipment. A pair of waders is nice, but I’ve had outstanding fishing in cut-offs and old tennis shoes: You just hop in the water and go where you want. Many wading river anglers prefer to start downstream and fish upstream. That way, any sediment that they dislodge moves downstream away from the fish being cast to. This is a good plan, but it’s not always practical. Fortunately, much of the time these river fish aren’t too skittish. If you move slowly and quietly, you can still catch them while casting downstream. If you know someone who owns a pond close to your home, ask for permission to fish there. These ponds can hold big bass and nice panfish as well as catfish. Promise the pond-owner that you’ll be respectful toward the pond. Treat that pond as if it were your own. Permission to fish private ponds is a privilege that needs to be cherished and appreciated. Show the pond-owner your appreciation. In the summer I travel with a small tacklebox and a rod and reel in my truck. When I have a couple of hours or maybe just fifteen or twenty minutes, I’ll stop by a local river or pond and makes a few casts. The contents of that tacklebox are very simple. I have a few Lucky Shad crankbaits in natural colors and bright colors. The bright colors are usually better in the rivers, the natural colors are good in the ponds. The Strike King Slab Hammer Crappie crankbaits in the Mini 3 size are good in rivers as well. Sometimes river fish like smaller baits. I also have some eighth ounce Slurp! Jigs rigged with Impulse three inch Swim’N Grubs. River fish like these, but so do the pond fish. 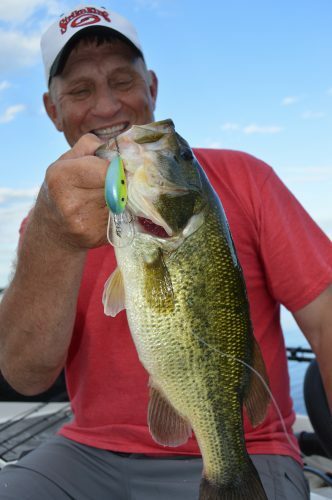 Jigs tipped with plastic and some crankbaits are all you need to catch these small water fish this time of year. The key now is to get out. These short fishing trips require no planning: You go when you get the time. However, instead of waiting to get the time, I suggest you make the time. Set aside a couple of hours at least once a week to get in on this opportunity. You’ll have a good time, and you’ll add to your annual fish catch. In fact, I’m guessing you’ll add to your annual fish catch more than you might think. Starting now, find that out for yourself.